Somewhere, out in the hills of Ballard, there lies a magical world. 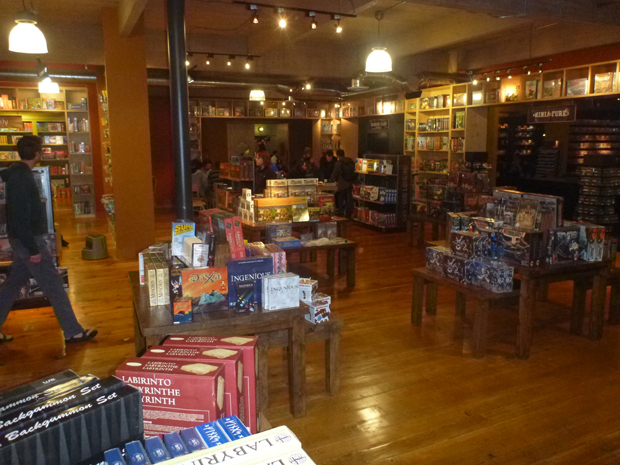 Nestled among the shoppes and houses, Card Kingdom is royalty among game stores. Inside of five minutes after walking through the door, I realized I was both sad and happy that I didn't live nearby. I could actually see myself spending every waking minute there, gaming until they kick me out, or I pass out, or they kick me out because I've passed out...either way, I would not get much work done. 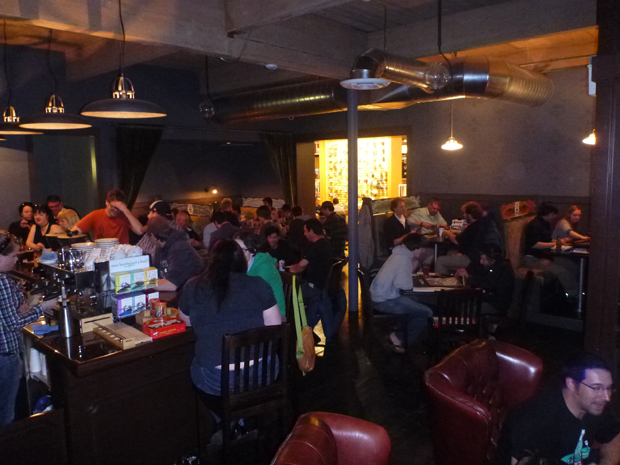 The first thing I noticed was the absolutely insane Café Mox. In addition to having drinks of both the adult and non-adult varieties, they have a sweet menu, including the best grilled cheese sandwich this side of my mom's. 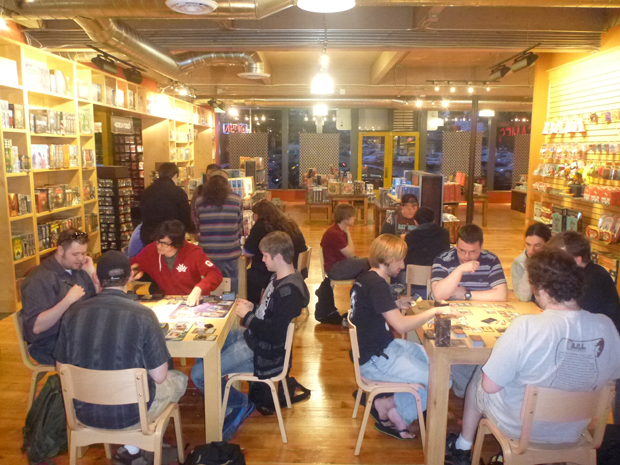 The Café was completely packed from the time I walked in the door with people playing all varieties of games, including Magic. 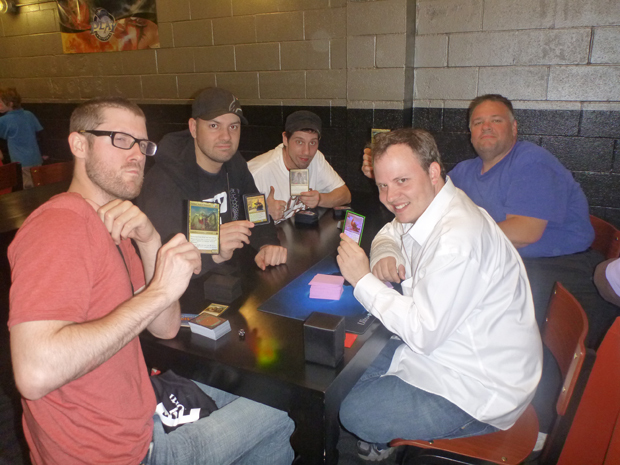 In fact, considering this was the day before the Commander release, Magic players dominated the room. 100-card decks could be found everywhere, of all colors and leadership. 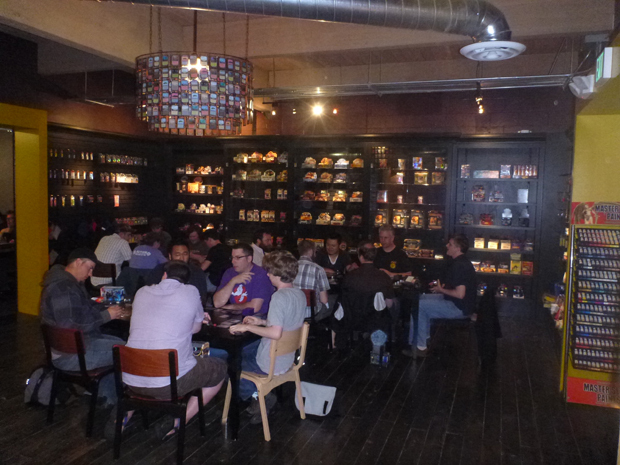 This is Cafe Mox, complete with overstuffed chairs and five booths painted in Magic colors. Wandering around the rest of the building made me realize how lucky the people in the area are to have a store like this around. It was absurd. A fan of miniatures? There are tables set up for those. RPGs? They have a veritable library of sourcebooks. Just looking for a place to sit and play some Magic? In addition to the tables in the Café, they have tables dispersed around four other rooms, including a hall with over a dozen of them! Seriously, check this place out! This is roughly one-quarter of the retail space. Yes, that is a Magic card chandelier! 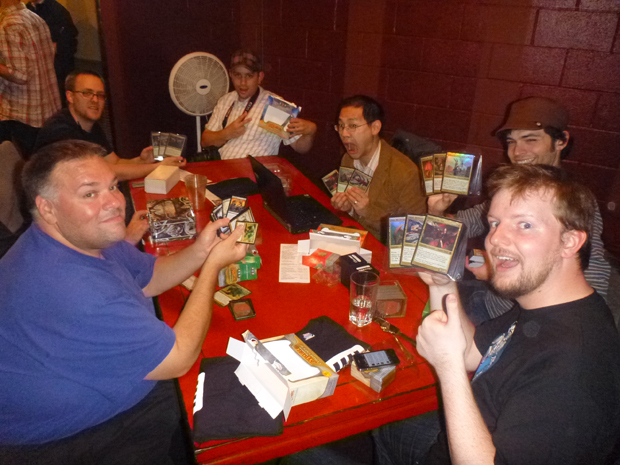 Not ones to be left out, the Community team took advantage of the Commander decks they were gifted to join the fun! 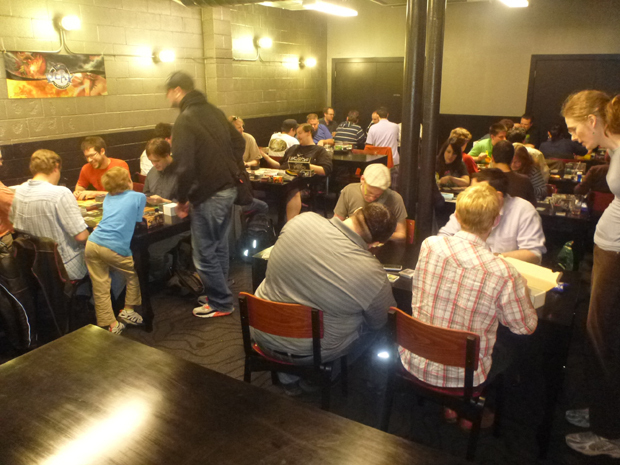 After opening and tweaking their new decks, as well as a belly-filling meal, the Community team venture out of the back room and into the fray. 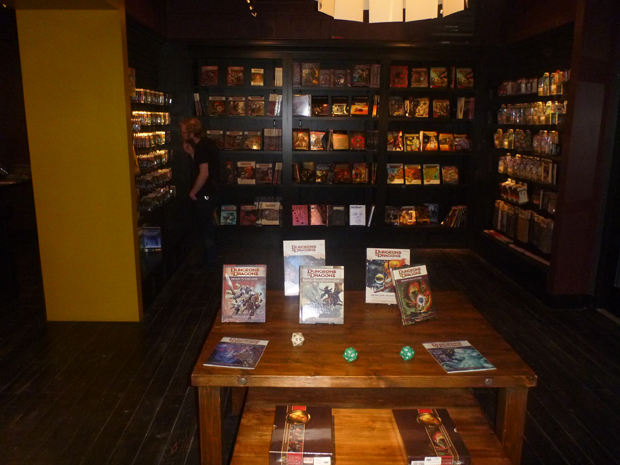 Across the store they trudged, through open rooms of gamers to two rooms filled with tables, ideally set for gaming. 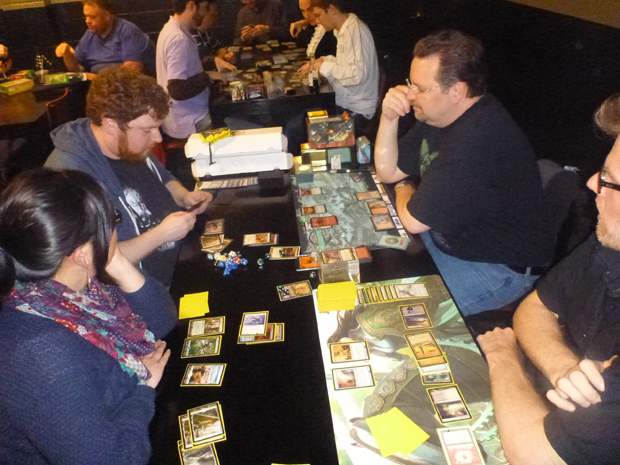 There were already dozens of players fighting against each other in a variety of formats, though most were celebrating the impending release with their Commander decks. 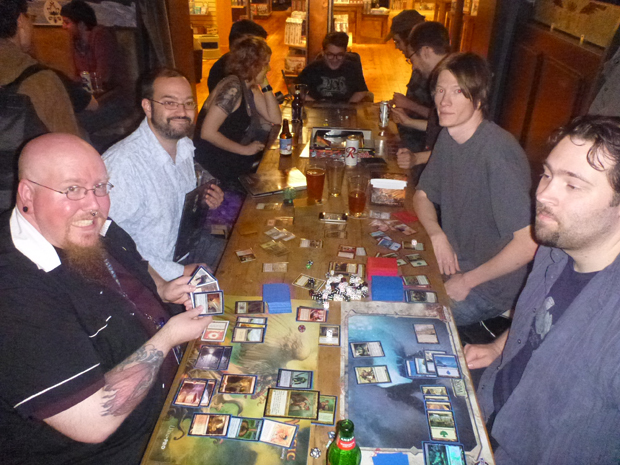 For many members of the Community team, this was their first experience with the format. Whiffy told me that his favorite part of the night came from a game he played with JoeKewwl, Marshall, and I. "I dealt 50 damage with one Lhurgoyf and killed three people," Whiffy, a.k.a. George Efelis, said. "I have definitely become a Commander player. It manages to be super-broken and balanced at the same time. I mean, everyone is doing their own broke things, and the games never seem to go too long." The play he was talking about involved a Pandemonium in play, and it was pretty deep into the game. He cast the Lhurgoyf from his hand, dealing a boatload of damage to kill Marshall. He then killed his 'Goyf and reanimated it, tossing another slew of damage at me. With that out of the way he got to swing for lethal with his other creatures. With that one turn, we had him hooked. The Community Cup was Enigma's first exposure not only to Commander, but to Paper Magic (and the dozen Mountain Dews he drank) as well! He ended up with the Political Puppets deck, or as he referred to it, "America!" 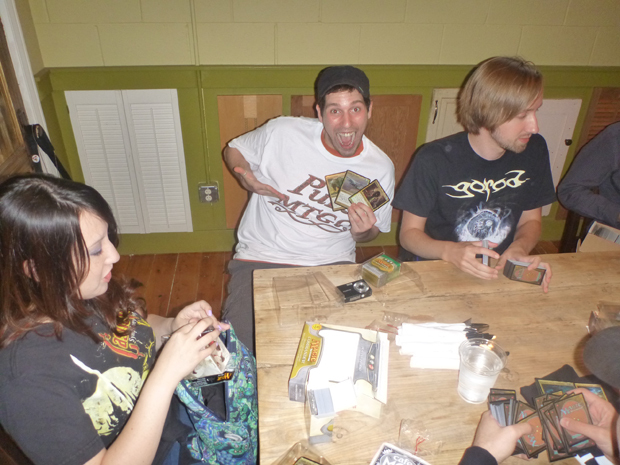 "I loved gifting my permanents to people and then drawing cards off of them!" said Engima (Josef Kronbichler) of his red, white, and blue deck. When I asked him if he was enjoying his Paper experience, he said, "Yeah, very much so. But...occasionally you miss things," he added with a sheepish grin. Sunie (Michelle Roberson) had another awesome experience in her game. "I gave all creatures double strike and killed two people at the same time. It was hilarious. I did forget to trigger my Shattered Angel after a Collective Voyage for 30. That 90 life might have been nice." While it was clear from watching them playing with smiles on their faces that everyone was greatly enjoying themselves, seeing them re-tell their stories after the fact solidified it. The experience was one of the best of the already stellar week, and everyone was sad to have to leave. But, all good things must come to an end, and there was still one more event to play. 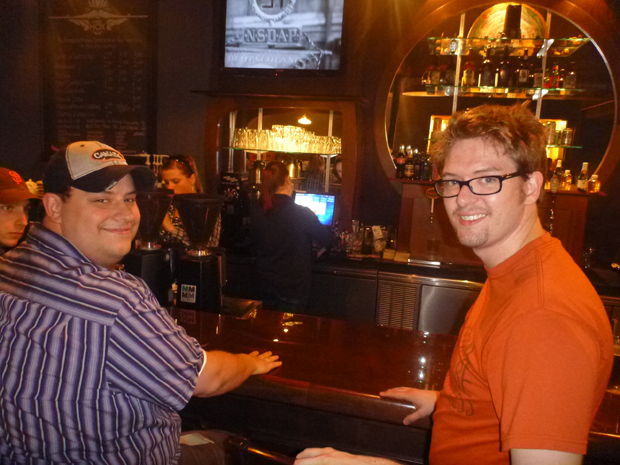 After a long night of gaming, the Community team trudged off to get some well-deserved rest. 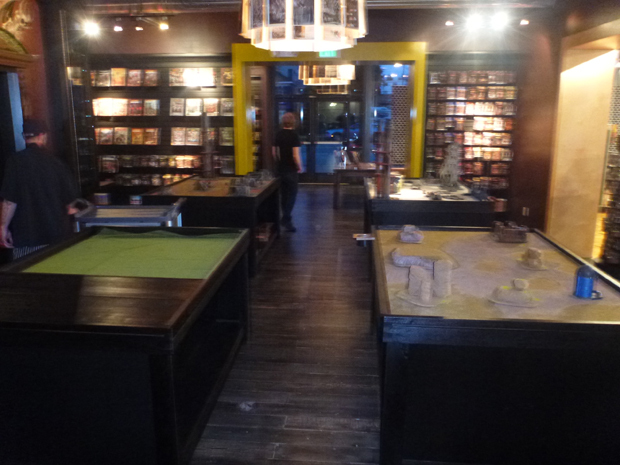 And you deserve more photos from Card Kingdom! By golly, it's Commander decks! Must be nice! There's excited, and then there's Bing Luke Excited! 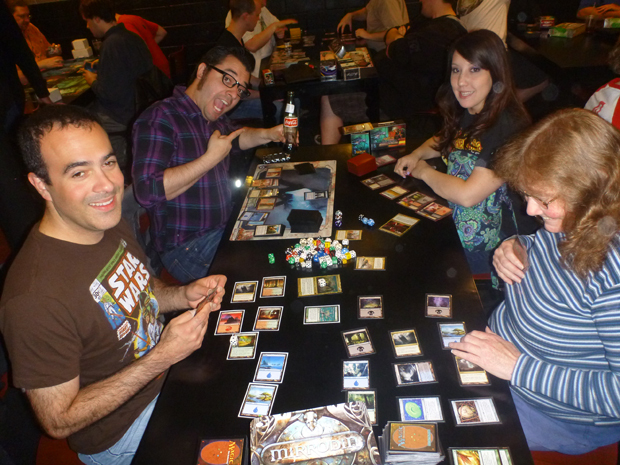 Everyone is excited to play Commander! Except Robles. He only has eyes for Mexican Coke. Why look! It's one of the men behind Commander: Scott Larabee! 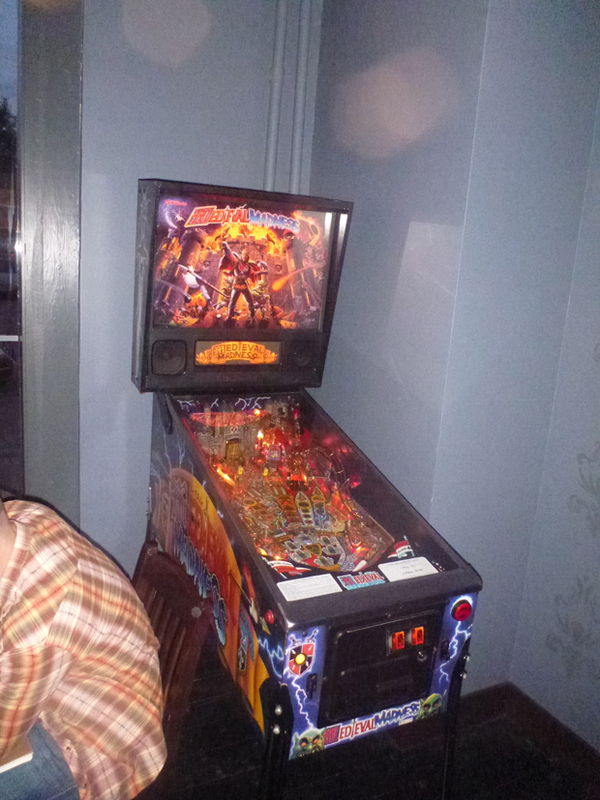 Have I mentioned how big a sucker I am for pinball? Magic in a café? The Digges is pleased. You can't walk five feet without tripping over a Commander game. Hey look! It's Ron Foster and Vincent Price! Even I got to get in on the action! 'Bout time!